With tailored rechargeable Li-ion battery and standard USB charging cradle, Fenix RC20 simplifies the way of charging. Whether the charging cradle is fixed in the wall or placed in the car, you only need to plug into the flashlight. 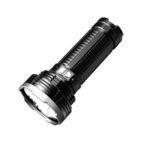 Moreover, the indicator light in the neck of the flashlight will present battery power level well. 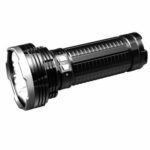 RC20 lights up long-distance view of 290 meters with its 1000 maximum lumen output. 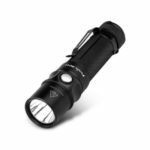 Dual tail switch features remarkable tactical ability and easily activates 4 brightness levels plus instant strobe and momentary-on function. Dual operation mode makes it better to satisfy the demand for law enforcement, driving, searching and rescuing, etc. 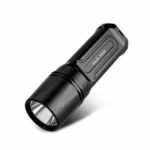 Uses Cree XM-L2(U2) LED with a lifespan of 50,000 hours. Tailored 2600mAh 3.7V rechargeable Li-ion battery. Over-heat protection to avoid high temperature of the surface. Intelligent memory circuit automatically enters the previously used brightness level when turned on again. 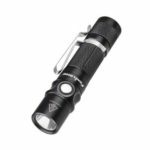 Dual tail switch features remarkable tactical ability and easily activates 4 brightness levels plus instant strobe and momentary-on function. Dual operation mode makes it better to satisfy the demand for law enforcement, driving, searching and rescuing, etc. 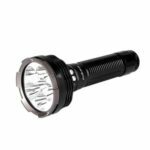 Anti- roll, slip-resistant design of the light head. Made of durable aircraft-grade aluminum, premium type Ⅲ hard-anodized anti-abrasive finish.